3 - Who Stole My Wallet? 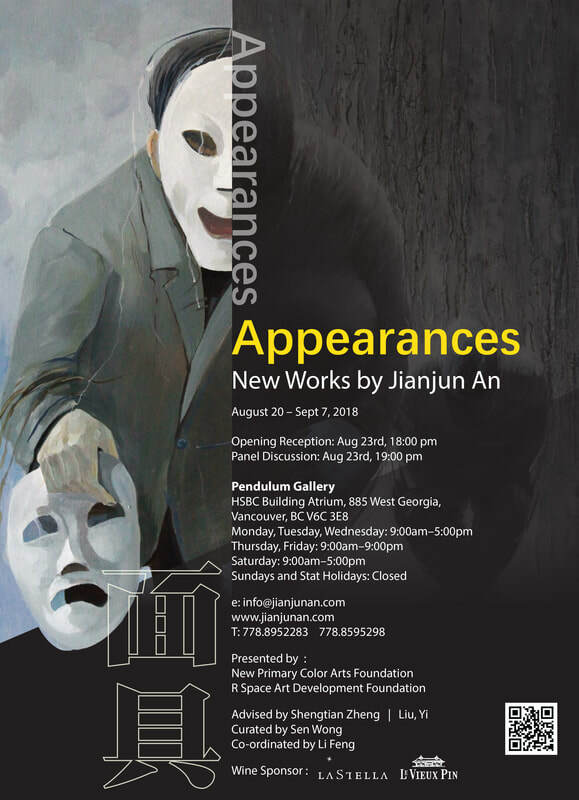 ​Co-hosted by Vancouver’s New Primary Color Art Foundation and the Vancouver Space Art Development Foundation, the Appearances - An Jianjun Painting Exhibition will be launched at the Pendulum Gallery in downtown Vancouver from August 20th to September 7th. We introduce Mr. Jianjun An, a vigorous artist and his latest artwork series, Appearances. An opening reception for the exhibition will be held as well as a round table conference on the evening of August 23rd. Several famous international and domestic mass media focusing on art will be invited. Additionally, critics, curators and the artist himself will attend the exchange activities as well. We genuinely welcome those who are interested to join us. Globalization has had a huge impact on human life, such as social changes at all levels of society, individual identities, regional geography, time, history, culture, language, and other interfaces that have been obscured and re-examined. Human society is in desperate need of a balancing power that breaks through the geographical and ethnic cultural boundaries and alleviates conflicts to achieve harmony and balance. Vancouver is a notable example of “immigration”. It has attracted immigrants from all over the world. Many immigration statuses at various levels have formed some very unique and diverse social ecology. Vancouver has long been North America’s gate to the Asia Pacific; consequently it also possesses various social resources. Just like how a person’s life resembles a painting, many remarkable immigrants carrying all types of identities gather in Vancouver to form a colorful ukiyo-e painting. Underneath all the splendor, immigrants are burdened with their native traditions and experiences in life. They face both their new home and the nostalgia of the past; they integrate and resist at the same time. In the end, the entanglement of countless cultural conflicts slowly come together to form a new value of thinking. Mr. Jianjun An's new series Appearances shows the paintings of more than twenty different types of Canadian immigrants from all over the world. These people carry unforgettable memories of the past, such as their wonderful life from before or even secrets never meant to be told. Once immigrated to Canada, these memories are repressed. Everyone inherits an appearance that is basically the same and equal, and they socialize with each other politely. However, the superiority or inferiority behind their appearance has been concealed by their very masks. Jianjun An, an artist with sharp perception, felt strongly about this as it had left a deep impression in him. His artworks reflect the current era and some of the most notable representations of the immigrants’ lives. They explore the relationship between the inner self and the external appearance. On the other hand, his artwork also reflects the influence of globalization in regional economy, politics, and culture. Mr. Yi Liu, the academic director of the exhibition, commented: “Appearances contains meaningful works that marks a crucial leap in Jianjun An's artistic practice. Mr. Jianjun An placed an incomplete mask in each of his artworks. These masks were deliberately painted yet do not garner attention, and the entire group of works was arranged in a row, as if it were an absurd drama being staged. None of the masks still hang on their faces, thus there is no need for them to exist because ‘the appearance is the essence’. In other words, most people cannot hide their true self." A large-scale life-sized painting presents a series of various personalities and representations. The artworks merged various personal identities and true emotional characteristics from the real world to provide viewers with insights on how we present ourselves and how we are seen by others. Jianjun An referred to these works as his series of “appearances”. This shows that the identity and self-image we present to the world is built by our own personality, yet it will be interpreted by various people in the outside world as stereotypes. The figures on these canvases are presented to the world in a way that implies a desire to interact with the audience; they have their own stories that illustrate and demonstrate that dialogues between individuals and cultures can help “reveal” the true identity of the subject. At the exhibition, the series Appearances is like a life stage that has been fixed for a moment. The figures and the audience are within easy reach. When various meaningful messages are self-speaking and recurring inside each audience’s heart, this very interaction and dialogue is also a meaningful thinking behind Mr. Jianjun An's group of works. Through the viewing of this group of works, we shared his past experiences in life, especially in his ten years after immigration, the insights, experiences, and thoughts gained from his own reflection. This is a bold art breakthrough in contemporary art. The New Primary Color Art Foundation is a non-profit organization registered in Canada. It focuses on cultivating and tapping the talents of young art students. The Foundation provides students with rewards to encourage outstanding students and provides financial support to exceptional students. At the same time, the Foundation regularly organizes art and design competitions in the community to help students organize social charity activities through the display of talents, and guides students to contribute back to society, and improve the artistic accomplishment and design level. R Space Art Development Foundation is a non-profit art institution in Vancouver, Canada, and is committed to promoting the Sino-Canada contemporary cultural and artistic exchanges and the collision and integration of Eastern and Western cultures. It also explores and studies the art of "immigrants," a contemporary cultural theme. The financial space provides public and professional people and institutions with open access to exhibition plans, lectures, and performances. Chairman of the Vancouver Space Arts Development Fund: Zhirong Huang; Executive Directors: Yan Guo/Yi Liu/Jianjun An/Ronghua Zhang. Curators: Chen Huang; Yuyang Long. For more articles on the exhibition, please click here. Click here to enter Jian Jun An 18 Limited Edition Print Sale, Every Print Personally Signed By Jian Jun An!